When it comes to games, everyone’s got that list of a handful of titles that has influenced the way they view themselves as gamers, and to some extent individuals. I know that sounds a bit heavy, but I know that I have movies and music albums that have really affected me, and it’s just the same with games. Have you ever wondered how your favorite developers feel are their most influential games? 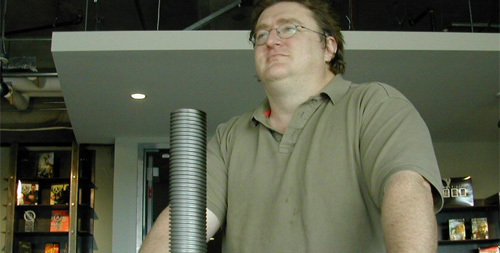 In a new feature titled Game Changers, CVG asks Valve founder Gabe Newell what his 3 favorite games of all time are. His answers? Star Trek on a Burroughs Mainframe, Doom and Super Mario 64, which convinced him that games are art (he still considers the controls to be unrivaled). I’m glad that Gabe Newell and I are in total agreement about Super Mario 64, which still stands as probably the greatest platformer I’ve ever played. Other influential games for me as a gamer would happen to be KOTOR, Final Fantasy VII and Counter-Strike. So what about you guys? What games have influenced you the most? What movies? Books? No holds barred! Super Mario 64 is definitely up there for me. It was the first game I ever played, and I wouldn’t leave it alone until I got all the stars. Following that up with Mario Kart 64, Banjo-Kazooie and Ocarina of Time firmly cemented me as a huge Nintendo fan. I’ve owned every one of their consoles and handhelds since the 64. On the movie side, I really wonder what my life would be like if I’d never seen the original Star Wars movies. Even though I was born more than a decade since the first movie was released, it really has influenced so much of what I’m interested in. I’ve spent so much time and money tracking down a lot of the Expanded Universe novels, Sci-fi/space opera is the majority of what I read, I’d go and see any movie with a similar sort of setting, games are the same. Probably why I fell in love with the Mass Effect games. Like Nick said in a podcast a while ago, those 2 universes are the cream of the crop. @supernovaforce I found out today that the X-Wing books by Michael Stackpole have been canceled. If anyone on GS hasn’t read them, go pick ’em up. Fantastic books. I think that Mario 64 is going to be tops for a lot of people. Just running around that world, exploring all those different environments…that game is really the only title to embody the generational leap. For games that are inspirational to me, I’d have to say…Ocarina of Time, Assassin’s Creed 2 and Gears of War. I think Ocarina is a pretty obvious choice, so I’ll explain the other two. Gears of War just because it was so freaking new for me. A cover based shooter (I know they existed before hand) that was co-op focused. It also helps that this was the first HD game that I played. My family actually went to PlayStation instead of 64, so Mario 64 didn’t really play a roll in my gaming life. Games that really stick out in my mind are Deus Ex, Quake III Arena and of course, Counter-Strike. I could go back to SNES to really say “those games shaped me”, but I don’t want to get all teary-eyed on you all! @Mitch – Thankfully I’ve already got all 9 of the X-wing books. You’re right, they are fantastic. Personally I prefered Aaron Allston’s Wraith Squadron to the Rogue’s, they were much more interesting characters (Gamorrean fighter pilot, fake Ewok, awesome) but they were much harder to find. I’d probably have to go with Shining Force and D&D: Warriors of the Eternal Sun, both on Genesis. Both these games placed me firmly in the RPG gamer mold, and I still look for time sinks and level grinders, even tough I have a much expanded palette now, Shadow of the Colossus being the more modern pick among my influential games, that and Elder Scrolls 3: Morrowind. Embarrassingly, I’d have to say the Dragonlance Chronicles are the books that influeneced me most, though I now look at those as pretty mundane, in middle school and high school I couldn’t get enough of them. I still think of them fondly, even though I know they’re trite. More recently, The Name of the Wind and Raymond Carver stories. For movies, I’d go Dark Crystal and The Last Unicorn, recent picks being Eternal Sunshine of the Spotless Mind and Pan’s Labyrinth. I guess I have a preference for fantasy, but that’s what influences are for, right? Love X-Wing! And Ooryl was the ultimate character.My people are the Gands. Coolest race ever. My shaping games, though, would have to be Super Mario World and Goldeneye. Those ones are in the forefront of my mind at least. My three would have to be Ocarina of Time (First game to engross me, made me a gamer for life), KOTOR (Began my love for RPG’s and all things Bioware), and Mass Effect (The perfect harmony of a video game and an epic sci fi story grabbed me like nothing I’ve ever seen, and solidified my desire to become a video game developer). Super Mario 64 is on my list. It was just…..amazing. Honestly it was just there at the right time with the right stuff. It was simply beautiful and amazing. Its still fun and challenging to play even to date. Probably GoldenEye for the n64 may go on there as well (Halo could take its place) It was the first real FPS I played, defiantly a changer in my mind. I could also throw in a game like Ultima Online in there. First time I played something like it and I got immersed into that game and its world. Simply fun. I like the mentions that are here. To me these arnt favorite games, they are what is inspiring. What is inspirational to me is the game Mass Effect. I say that because it was one of the first non-shooters that i played and it changed what I played completely. I now play TONS of different games and I feel if I had not played that game my gaming experience would be very deprived of fantastic titles like the Assassins Creed games, Batman: Arkham Asylum, and Sam and Max. I think the top 3 games that influenced me the most were Oblivion, Braid, and Majora’s Mask. Oblivion introduced me to the concept of a truly open world, where you can choose not to do the main quest at all, and just branch off on your own. It made me really feel free, especially with the mods. Braid is probably the closest thing to art I have ever seen. The platforming is highly new and unique, the puzzles are amazingly complex, the music is great, and the story is compelling. The ending was what really got me though; it is the greatest ending I have ever experienced. It really convinced me that games ARE art. Majora’s Mask taught me that familiarity often makes a game better. The game was running on the same engine as OoT, with the same MIDI instruments, the same character models, and the same ocarina. And yet, the game was better than OoT. I felt more attached to the story, and the characters were more unique, as opposed to OoT where the majority of the population consisted of nameless NPC’s.